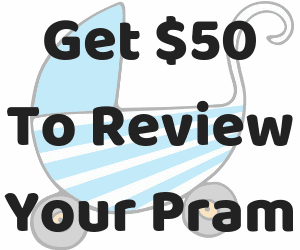 The Uppababy Vista (available at Baby Train) has been around for years now (I want to say around 2007 was when the first Uppababy Vista came out) and it was included in our Best Pram in 2016 list. Quick story before I dive into the review. A couple of years ago I spotted an Uppababy Vista off in the distance at a winery. It was set up as a double with two upright seats, with the “piggyback” toddler board attached as well. (Though it was folded up out of the way. So they weren’t using it at the time). So they had two tots in the pram and one older child trotting along beside. 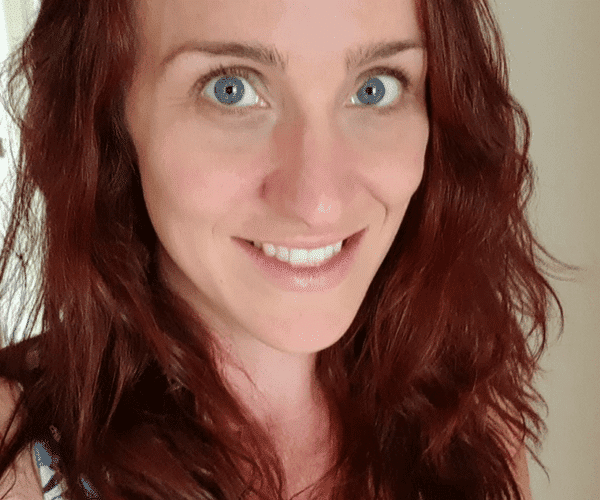 So, I plucked up the courage to approach a random family to ask them about their pram (perhaps the wine tasting I’d been partaking in helped me push through my shyness). And they absolutely raved about their pram. They have three small children. They’d had it for years. They travel with it. They couldn’t be without it. Also at the time they were pushing it fully loaded with two kids around a hilly, bumpy, grassy winery. So that was a pretty solid endorsement! So looking at the 2018 Uppababy Vista compared to previous years models it is a little narrower, little lighter, it has 100% full grain leather features on the handlebar and belly bar. The bassinet is a couple of inches longer with the 2018 model. 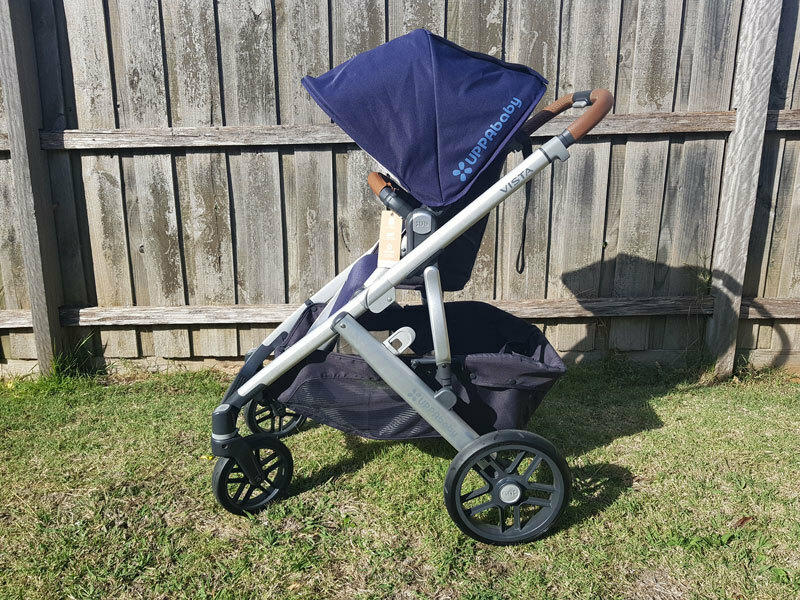 They offer a range of “Melange” fabric for the hood and seat – which is very fashionable in prams at the moment. And the frame is now powder-coated, rather than carbon-coated, making it less susceptible to scratches. The Uppababy Vista comes with both the upright toddler seat and the newborn bassinet, so it’s good to go from birth! The other great thing about having both of these seats included is you’ve already got them for the future, when and if you have another baby. 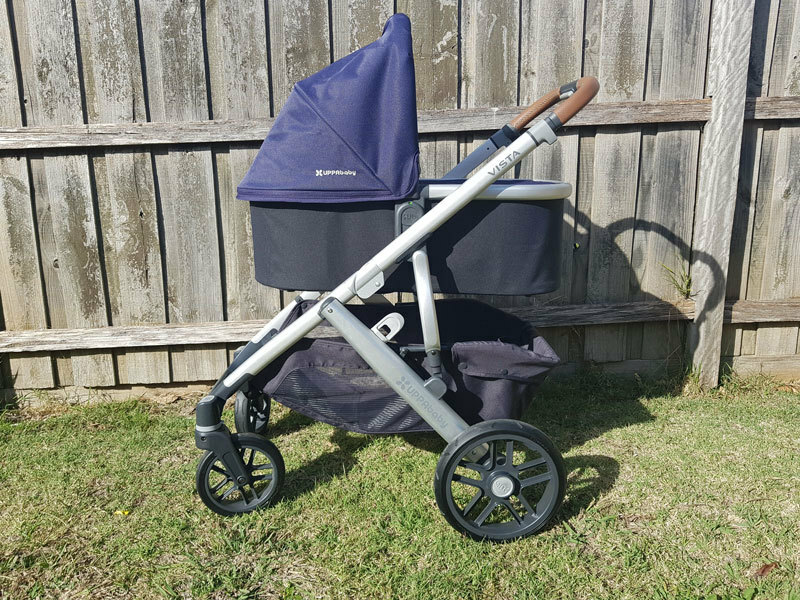 There’s a really logical life cycle for this pram. Obviously starting with baby number one in the bassinet. Baby outgrows it and moves into the toddler seat. Second baby comes along* so you then use both the bassinet and the toddler seat on the frame. Third baby comes along, second baby moves up to the toddler seat, and first “baby” goes onto the toddler board. So simple. So beautiful. *and go out and buy the top and bottom adaptors. 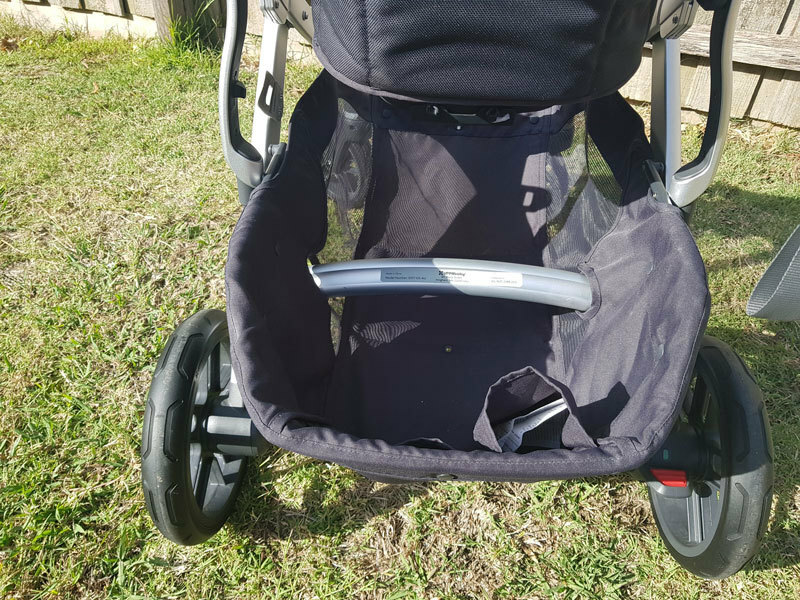 Whereas the Uppababy Vista will still accommodate a child up to 23kgs in the main seat and up to an acceptable 18kgs in the “Rumble Seat” for a second toddler (which needs to be purchased separately). 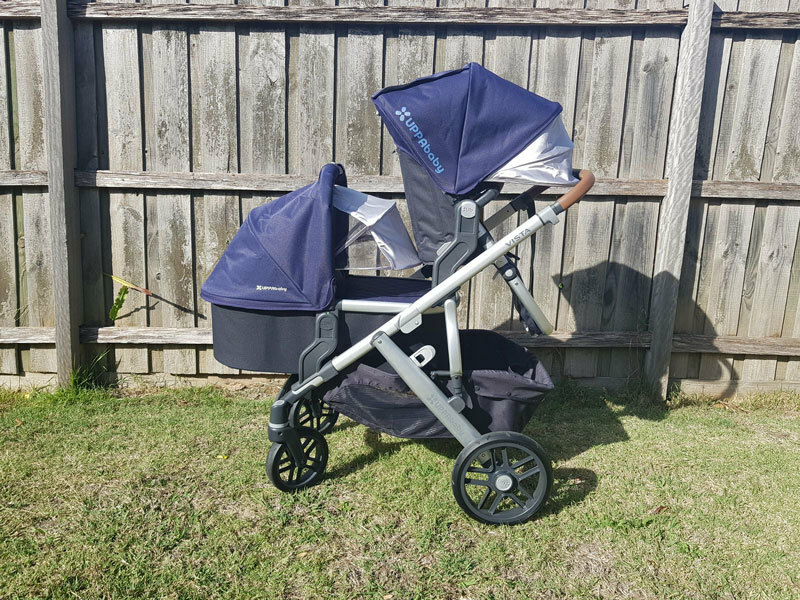 Overall I think the Uppababy Vista is a great pram. It’s thoughtfully designed, and easy to use! The only thing I’d like to make a note of is it is a big pram. So it’s quite bulky folded up and I was unable to fit the frame and seats into the boot of my Kia Rio (small car). So the Uppababy Vista is better suited to families with bigger cars! 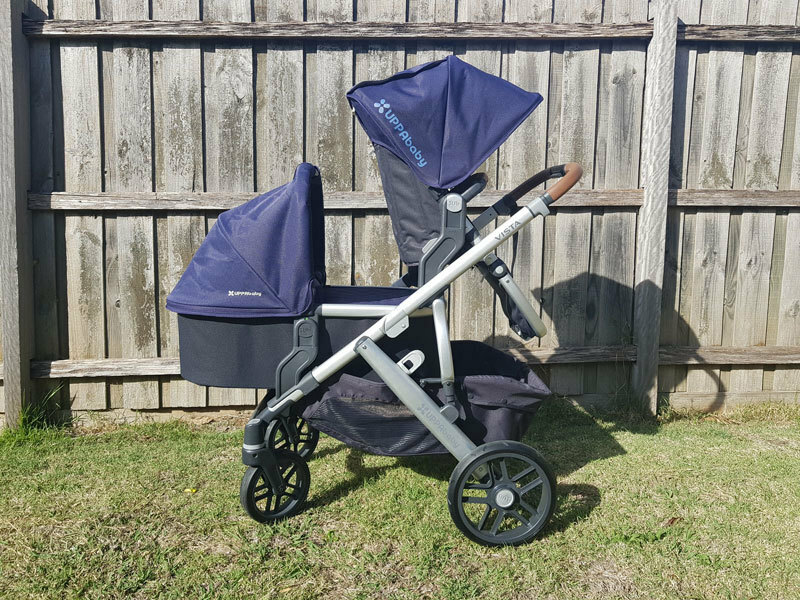 I borrowed the Uppababy Vista to review from the lovely team at Baby Train.